In Japan, Tsubaki oil obtained from Camellia japonica has been used for beauty treatments from old times. It is called tea seed oil in English, but it is different from tea tree oil. Unlike those hair products on the market, tsubaki oil is 100% natural and harmless to skin. Though it is oil, the texture is not greasy but silky, and well blends with skin and hair. You can directly apply a teaspoon of the oil into wet hair, or mix it into shampoo and conditioner. The following is [How to Get Shiny Hair with Tsubaki Oil Hair Pack] posted on nanapi.jp. 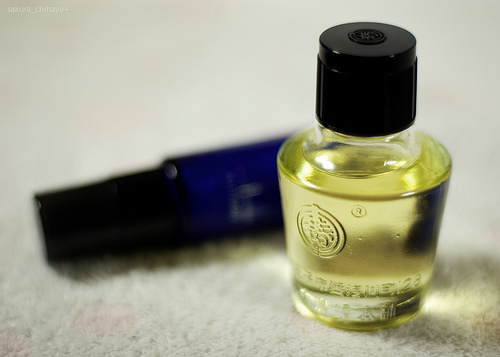 What you need: tsubaki oil and towel. To rinse the oil, you need: olive oil soap, tsubaki oil soap, or any shampoo soap bar, and lemon juice. Drip tsubaki oil on your scalp (at least 1/2 tablespoon). If you have long hair, blend the oil on hair ends too. Wrap your hair with steamed (hot) towel and keep it about 5 minutes. If you have a conditioner for shampoo soap bar, use it, but if you don’t, mix 10ml of lemon juice into a washbowl of warm water, and rinse your hair with the mixture.